First off, when learning the forehand, it is often taught making them use a full backswing. I find this to be really difficult for some people, and it prevents them from learning how to make proper contact with the ball. So, I find it better to teach people by having them already in their contact point phase of the stroke before learning the full stroke. (See picture above) As you can see the contact is made with elbow in front of the body with the racket face practically perpendicular with the ground. I often see people at contact having their racket faces too opened up which causes balls to fly high and go out. Notice how his wrist and racket show a 90 degree angle relationship. It looks like an L shape between his arm and racket. This is crucial when achieving leverage for your stroke. When working on developing our contact point, have your student go into the contact point position as much as possible, similar to (picture above), with the arm bent and in front of the body and the torso should try to be parallel to the net. Make sure you are not gripping the racket too hard. Try not to apply too much pressure on the handle – stay relaxed and pretend you are holding a bird enough that it won’t gly away yet won’t choke. Have someone feed you a few balls and work on the contact point; remember that it is crucial that when hitting the ball that the racket face is at most parallel to the net or slightly even a bit more closed. To strike the ball properly, you need to be HITTING THROUGH THE BALL, not brushing it for topspin. It is essential to hit through the ball because that is how you get the control over your power and spin. It’s a common misconception that players BRUSH the ball for topspin. Brushing is mainly used for topspin lobs (where you send the ball really high in the air) and wicked angles. Practically every pro hits through the ball. What does ‘hitting through the ball’ mean? People often mistake ‘hitting through the ball’ as a linear push through the ball. Well, that actually is ‘hitting through the ball’ but that’s not how it is done anymore in the modern game. Doing this actually slows down your racket-head speed. So what do I mean by ‘hitting through the ball’? The idea is, your swing from the forward swing phase to the follow through should connect smoothly. Try swinging your arm around and notice how your arm travels in circurlar path. Imagine a half-circle in front of you; you want to trace it with your racket. You want to find the ball at the correct time in the circular path (The contact point position which is addressed). That is the most natural way to be hitting the ball. 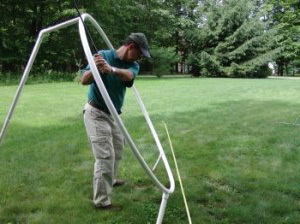 Check out this golfer for an idea of how the swing represents a circular path. Note: You are usually in the right path in correctly hitting through the ball if you are neither really brushing the ball nor really knifing the ball (which creates backspin). On the end phase of the stroke,you want to finish across your body right next to your shoulder to complete the circurlar path. When you follow-thru, *your arm should finish in a position where it looks like you are checking the time on your watch (THIS HOW YOU FINISH THROUGH THE BALL CORRECTLY) (see picture below)*. . Practice this until you feel like you can confidently move on and learn the full technique by incorporating your body. Note: The whole motion on the forehand, it is essential that you grip the racket as loose as possible while still having control over your racket. However, when you make impact with the ball, realize that your grip will naturally tighten up, but this is something not to think about. Just know that this is normal. When coiling your body, you want to turn your torso, shoulders and feet sideways to the left fence (right fence if you are a lefty) for an open stance forehand. You should be loading your weight on your right leg (for righties) – See Picture above. Note: For a closed stance forehand where you step in with your left foot (for righties) you still want to coil your upper body – torso and shoulders and transfer the load to your left leg. It is important to have some kind of loop in your backswing because it adds racket-head speed which increases power and spin potential. When beginning a loop on your backswing you want to make sure you turn your shoulders to the right fence with your left arm on the throat of the racket (Picture above). Note: For rhythm purposes it is best that you are already in this position once the ball has bounced. That way, your loop can smoothly transition into the set-up position. Then, in a relaxed manner, drop your racket-hand down to about the level of the ball (See picture above). Remember that the tip of your racket should be facing towards the back fence, because if it was facing the side fence, it would make the swing more complicated on the forward swing. You are now in the setup position where you are just about to swing at the ball. Now we are just about ready to learn the hardest part of the forehand stroke. It is the most neglected explanation of the forehand stroke. It is what happens between the setup position and making contact with the ball. It is called the forward swing. Note: This is the most difficult part of the stroke and many people fail to grasp how it truly feels. So it is okay not to get it the first time. Why do tennis players need a strong core? Because of this part. This is the part where having a loose grip on the racket and a relaxed arm matters most. You NEVER want to power up your shots by swinging just your arm as fast as you can. In tennis, the body essentially swings and accelerates the arm. YOUR ARM IS PASSIVE AT THIS MOMENT. Now, when entering the forward swing, you begin by pushing off your right leg which initiates the core and the hips. **As a result of the opening up of the hips and core, your racket will lay back into the ”buttcap” position (Just like the pictures above) and then your arm and racket will spring forward and accelerate through the ball on its own**. This is the most complicated and important piece of the stroke because it creates the leverage and insane racket-head spead for effortless power. It’s like a sling-shot effect. Also note that federer and novak’s arm positions in the buttcap position are different. Federer has a straighter arm and Novak has a more of a bent arm. This is a preference, so choose what works best for you. It is crucial that you stick with one of those two to develop a consistent forehand. Refer back to part 1 to see the explanation of the follow through. 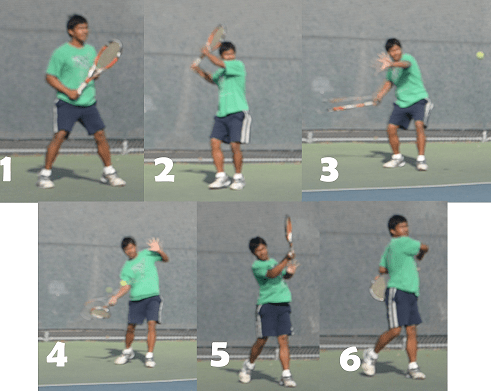 Remember do not mechanically combine these steps when hitting your forehand. You want to smoothly combine the steps. Picture 1: This is called the ready position where your dominant hand is prepared in its forehand grip and the non-dominant hand is holding the throat of the racket. Picture 2: Once you know a forehand is coming, you begin by turning your shoulders just enough that your left shoulder is just below your chin. As you are taking the racket back, your left hand should still be on the throat of the racket. Picture 3: As the ball is coming towards you, put your weight on your right foot. Then, let go of your left hand from the throat of the racket and keep the hand towards the left fence. While you are doing this, your racket arm should begin to move past the right shoulder and begin to be set down just like the picture shows. The racket should be set about leveled with the ball and the tip of the racket should be pointing at the back fence to make the transition from the set up to the forward swing more smooth. Picture 4: You begin the forward swing by pushing off the right leg which opens up the core and hips. As a result of your cores and hips, your racket will lay back in the buttcap position and your left hand will go back. Picture 5: As a result of opening up the hips and the core to your target, the racket will accelerate through the ball on its own. Picture 6: To properly decelerate, you should finish across your body where your arm is in a position where it looks like you are checking your watch. Your rotation should naturally decelerate towards the left fence. Q:How long is the racket in the buttcap position? A:Your racket is in the buttcap position for about only 0.100 seconds. Q:Is my arm actually passive on the forward swing? A:For the most part, yes it passive. The core is what accelerates your arm. However, the type of follow through you want (lasso whip, over the shoulder, across the shoulder) I would say that’s the only part your arm plays in the stroke, but it’s still not even that active. To end this off, I want to remind everyone that this is the basics of the modern forehand. Hope you guys stay tuned as I will post a tip in detail on how to direct your shots. So it is key to get into the set position *before* pushing with the dominant rear leg. Is there any pause once the unit turn is completed? Not necessarily, but it is a nice default point. If you set higher or lower than the ball, then you are altering the trajectory of the ball. So in a sense, this default point allows for more control. I’ll definitely try to add that in!